LOG LINE: When an imaginative painter is warned by his doctor that his health is in jeopardy due to poor eating habits he takes up cycling to get in shape. It isn’t long before his cycling sessions lead him to hallucinations that he’s on an actual road being followed by an unknown force. 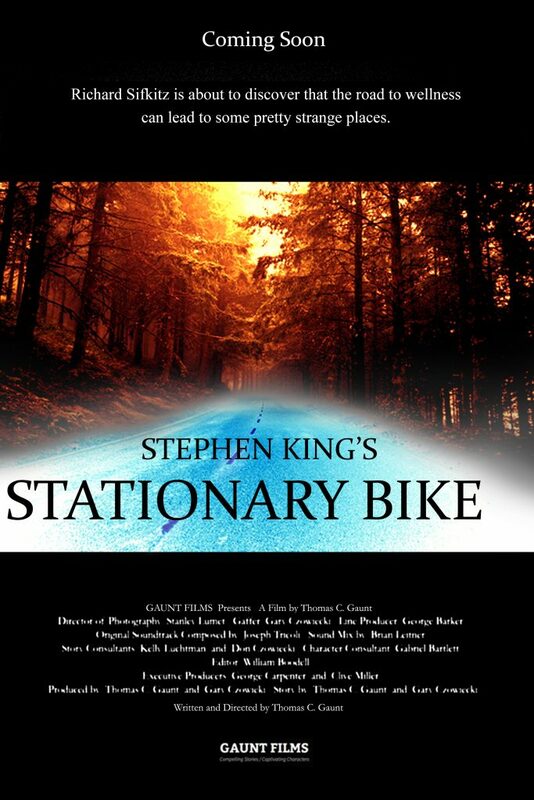 SYNOPSIS: A short story adaption from Stephen King’s 2008 ‘Just After Sunset’ anthology, STATIONARY BIKE tells the story of a man at a crossroads with his health and his sanity. After being told by his doctor that his cholesterol level is too high, Richard Sefkitz begins riding a stationary bike in the basement of his apartment building. To help alleviate the boredom, he buys maps and plots a route from New York to Herkimer, a town on the U.S./Canadian border, each day marking the amount of miles he has “ridden” towards his goal. He also paints a scene of a road on the blank wall in front of the bike to help him imagine actually traveling the road. As he nears Herkimer (according to the miles plotted on his map, at least) and has gotten in great shape physically, he begins having strange thoughts that there is someone following him on his daily rides.